Alice, Franco, and I spent the day working in the Estivant Pines. On our first trip to the sanctuary this spring, we discovered a large oak tree that had cracked about 12′ up, and bent over into the trail. We trimmed the branches away the best we could with the small saw we had, but I knew we’d need to come back and finish the job. Well, today was the day. I decided not to take any chances with this tree. When they are bent over and touching the ground like this one, they can fall unpredictably. There can still be tension in the bend, for example. So when I packed up for today’s trip, I included two heavy nylon straps and a come-along. I strapped the tree trunk as high as I could reach, and put the other strap down low on a nearby healthy tree. Then I connected the come-along between them and cranked the handle until there was pressure on it. Then I fired up my big Husqvarna chainsaw and cut the notch. I moved to the back of the tree and carefully cut towards the notch until I detected the slightest movement of the tree. The tension I’d put on the come-along caused the cut to open up slightly. I shut off the saw, moved back to the come-along, and gave it several more cranks. 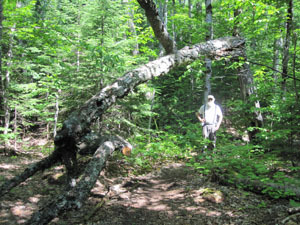 I did this a couple of times until I got a satisfying CRACK out of the tree, and it came over just as I had predicted. 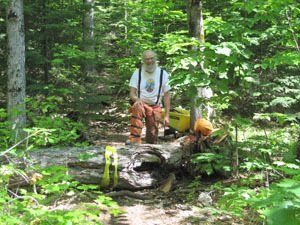 All that remained was to cut away a couple of hunks to clear the trail, load the wheelbarrow back up, and head out for the next project. We spent about 3 hours up there today taking down the tree, cleaning out waterbars, and trimming branches. There is always lots to do, and we always feel like we’ve left it better than it was when we got there. Good news everyone! The buckwheat in both gardens is starting to blossom. I always enjoy this milestone in the garden. 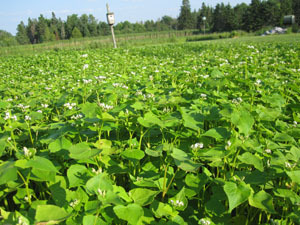 In the next few days I’ll be rototilling this batch of buckwheat in and planting another batch. I like to let it blossom for a while, though, because buckwheat is very generous with it’s nectar, and the bees love it. Some years, it is hard to get the tilling done because there is so much buzzing all around me. As I go round and round the garden, the bees move to the center, and that last stand of buckwheat is usually thick with them trying to get their last sip. But not this year. I’ve looked twice now, and can find no bees in any of the buckwheat. None. Where have the bees gone? I buy quite a bit of used stuff. I don’t think I’ve ever had a new riding mower, but I’ve done well with the used stuff I’ve bought. The John Deere 210 rider I’ve had for nearly 2 decades did hard service before I owned it… it was the mower for the cemetery up the hill until they wore it out. I put some money into it, and got many years of good service out of it. 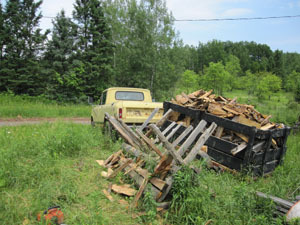 Over the years, I’ve split all the wood we use by hand using sledges and wedges. Both these trends came to an end today. 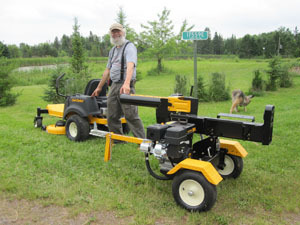 I’ve been shopping around for some time this spring for a new mower and a log splitter. I called several of the local shops, and requested bids on the machines that were highly rated on Consumer Reports ™. Last week I accepted the bid from Pelkie Outdoor Equipment near Baraga, MI, and today the new guys were delivered. Oh, what a nice thing it is to put the key into the mower and have no concerns about it starting, breaking a belt, slipping a bolt from the mower deck (yes these things happened pretty often.) And these Zero Turn have caught my eye from the very beginning. I mow around lots of trees, bushes, and buildings, causing me to do a lot of back and forth stuff. Once I get the hang of this new machine, I shouldn’t have to do so much maneuvering. I also started the splitter, and can tell you it is way easier to split wood with this machine than it is by hand. I worked my way through a bunch of wood that had stacked up last year, and once I got the hang of it, the biggest problem seems to be keeping the thing fed with logs. I’ve been kind of resentful of how often I’ve had to cut the grass this summer, and have not been eagerly anticipating splitting next year’s firewood. Both these dreads have gone out the window. After the busy maple syrup season this spring, I haven’t been out to the sugar operation very much. I tend to close up shop and move on to other things for a while. I think I get “sugared-out” by the end of the season. 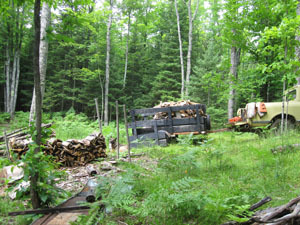 Most of the wood I use for boiling the sap comes from the slabs I generate from my sawmill. I have an old sawbuck I cobbled together years ago which sits near the sawmill. As the slabs come off the mill, I try to stack them up on the sawbuck, and chainsaw them up when it gets full. These chunks are tossed into the trailer, which is where the difficulty comes in. You see, the trailer also can get full. And when it fills up, that means a trip out to the woods to empty it. That was one of today’s projects. Franco and I hooked the trailer up to the Scout and drove out this afternoon. It was hot and buggy, but we stuck with it. We are having a lot more rain this summer than usual, which makes things slick on our clay roads. But we got the Scout and trailer into position, and started unloading. I’m often in a hurry when doing this chore, and will just toss the slabs off in a pile and drive off. Today I decided to take the time to stack them, and I’m glad I did. I got about 1 1/2 singles done, and even got some sheet metal on the full pile. Assuming it doesn’t fall over before next maple season, this should be primo firewood for the next maple season. One would think that a story entitled, “The Advantages of a Headache” would be a short one indeed. Those of you who share my misfortune of being susceptible to migraine headaches probably think I’ve gone off my rocker. Those of you that know me well are sure of it. Now that I have access to Maxalt ™ I can get rid of several of the worst symptoms a migraine brings me. Today I had a rip-snorter of a headache. Alice and I had a social obligation in town, which we accomplished. When we got home mid-afternoon, I took a Maxalt ™ and had a nap. When I got up, my head no longer hurt, but I felt like a balloon from which all the air had escaped. Just walking across the room was an exercise in patience. Before supper Alice and I like to walk out to our back pond and sit in camp chairs on our dock. It is a great ritual we both look forward to on most nice evenings. Franco is enthusiastic too because he can swim, chase sticks, of rest up as he sees fit. Tonight’s dock-sit came as I was recovering from the headache. I sat there like usual, except I didn’t feel much like talking. Then in a fit of strange habit-breaking impulse, I lay down on the dock with my head hanging out over the pond. It took a few minutes for the perspective to change, but when it did, what a show I had. One of the leaves of pond weed close to the dock was askew and slightly submerged. As I looked at it, I discovered the reason was that a tiny snail had taken up residence. It’s perfect spirals glistened just below the water’s surface. There were numerous small insects flying quickly just above the water’s surface, and among them flew the damsel flies; green and iridescent blue. On one leaf a damsel fly had alighted, and an abdomen had emerged from beneath its leaf and was probing for it. It turned out to be another damsel fly completely under water. Perhaps a metamorphosed teenager just becoming an adult? You get what life gives you, which sometimes involves headaches. These things can slow you down, but possibly if you keep your radar active, you’ll slow down enough to discover and observe a world you didn’t even know existed. This is a sequel to The Law of the Garden. After a day of work around the homestead, we both enjoy a peaceful evening of mellowing out, allowing the muscles to relax, and dozing into a well deserved sleep. For me, there is one thing that is best at postponing this lovely ritual, something that must be corrected before anything else can happen; something that unleashes The Law of the Bedroom, a mosquito. Even with a pillow over my ears, I can hear their whine. If I’m very tired, I sometimes try to ignore the sound and fall asleep anyway. They only want one drop of blood, right? Well here, you can have it. Nothing doing. My skin is on high alert, and every quadrant erupts into itch-alerts. When a moment before I was a sausage of relaxed flax meal, I turn into a turgid mass of adrenalin. So I get up, grab a handy piece of cloth, and squash whichever ones I can catch against the ceiling or wall, while my life partner smiles coyly from behind her book. As is the case with so many laws, the enthusiasm of the lawmaker is often not matched by that of the general public. Any gardener will tell you that they’ll take a detour towards the garden when going somewhere so they can look the plants over. I don’t think many of us know exactly why we do it, or what we think about as we stroll by, but information is gathered. Are the garlic plants ready to be harvested? Should we water? 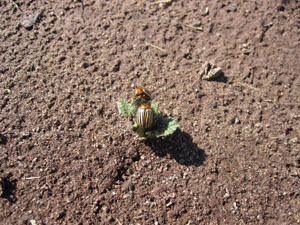 Are there any *shudder* a potato bugs on the plants? One rule I’ve made for myself is, whenever I’m walking by the garden and I see one of those lovely striped beetles, I’ll stop what I’m doing, grab the little plastic cup with soapy water, and dispatch the little blighter. We make special efforts to do this in the beginning of the season, because it is the adults that are attracted to the young plants. They eat, mate, and lay a gajillion eggs. It is well nigh impossible to get all the adults, but every one kept from laying eggs early on saves lots of effort. Early in our gardening career, we took more of a live and let live approach. As organic gardeners, we felt that if we gave the plants whatever they needed, they could fight off the infestation. Some years, the harvest was bleak indeed, although not surprising, because the plants were reduced to mostly stalks. So we declared war, and drown every one of the little guys we can find. And we find a lot. You are currently browsing the Rural Life in the UP of Michigan blog archives for July, 2013.